Fine Brandy recommendation for the weekend: Try the Uitkyk 10 YO Grand reserve. Estelle Lourens, winemaker at the estate, describes the result as a rare, exceptional brandy of high complexity with an ideal wood balance and an alcohol level of 38% volume. On the palate it displays a potpourri of flavours including fruit, vanilla, cloves and other spices. Today’s featured vintage wine is the Allesverloren Shiraz 2004. Aromas of ripe plums, berries and oak spice with hint of cigar box. Rich and full-bodied with ripe plums and berries and good tannic structure. 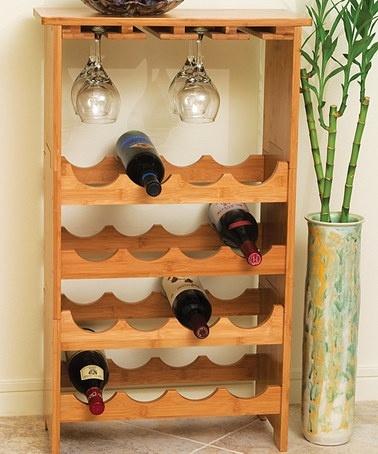 Plain and simple, but a great looking wine rack. The Touriga Nacional is a varietal used almost exclusively for the making of port, but Allesverloren winemaker, Danie Malan has been making a small amount of Touriga Nacional wine for a few years now. Aged in second and third fill barrels for eight months, this wine’s rich raisin and blackcurrant aromas are complemented by hints of vanilla and oak spice on the medium to full-bodied palate.